Amidst a general strike against the UN mission's perceived inaction against insecurity, the recent suicide (or is that killing?) of the head of the UN mission, and delayed elections, a panel took place last week in the Haitian capital about Marie Chauvet's novel Amour, Colere et Folie. (The subject of kiskeyAcity's very first post.) 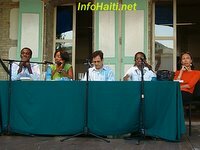 According to a story by www.infohaiti.net, the panel was organized by the franco-haitian academic journal Conjonction and panelists included Alix Emera, Nadève Ménard, Darline Alexis and Yanick Lahens. Among various themes, panelists highlighted the work's relevance to haitian literature and to haitian women's literature.